If your home has an office space, it can be the perfect location for you to get some work done on the weekends, to study for a big exam, or to even start your own business from home. No matter how you use your home office, you want the space to be functional but stylish. The right lights can help turn your office space into a more usable location in your home. As indoor lighting experts in Eugene, we take pride in helping our clients turn their homes in a more usable and beautiful space. Read on to learn more about how you can design the perfect office lighting in your home and reach out at any time for help from our team. One of the most important components of your office will be your desk space. 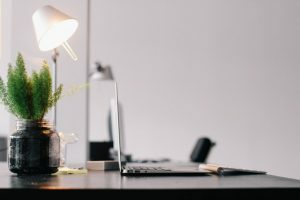 Your desk is the location where most of your work will be done and it needs to be a functional place. Make sure that when you are choosing the lighting for the room you focus on the area your desk is in to create the best lighting possible in this area. While you want the desk area to be well lit so you can read all your notes and papers, you also want it to be an inviting space. Choose a beautiful lamp to illuminate your desk space or a stunning modern track light to hang above your desk. Whatever light you choose for this area, make sure that it casts enough light without becoming overwhelming. Think about the placement of the lights and where shadows will fall as you work. The last thing you want is for a bright glare off your computer screen or shadows from your own shoulder. Your desk space will be the most important part of your office but don’t discount having a space to get away from your desk to study or read. You can utilize a beautiful, comfortable chair in a corner with a tall lamp light to design an inviting space for reading. You can also light this area with a unique pendant lighting or sconce lighting. These options will keep the space uncluttered and cozy. Traditionally, many office spaces featured harsh overhead lighting that created an uninviting workspace. The good news is that with your home office, you can choose a much softer and more natural lighting design. This will create a better place for getting work done. Choose sconces that allow for extra lighting throughout the room without the need for strong fluorescent lights. Implement stunning floor lamps to create extra lighting in specific areas and allow for the ability to have some lights off while you work. The best way to design office lighting you will love is to work with an expert designer who can help you utilize your space to your best advantage. If you are looking to redesign the lighting in your home office, talk to our expert team today. We specialize in indoor lighting solutions in Eugene and we can help you craft the home office of your dreams.